After losing over 100 pounds, this patient (in her 60's) had a large amount of loose and hanging skin. Dr. Rodriguez performed a lower body lift (belt lipectomy) which removed excess skin and fat from her abdomen, stomach, and thigh areas. The body lift also included a buttocks lift which tightened and raised her buttocks. 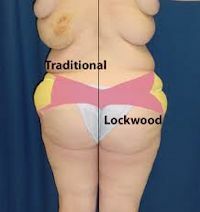 A Lower Body Lift, or Belt Lipectomy, is the combination of a Tummy Tuck, Outer Thigh Lift, and Posterior Buttock Lift performed in the same operative session. Interested in a belt lipectomy (body lift) to get rid of loose skin after weight loss? Check out this blog post where Dr. Rodriguez discusses the Body lift techniques he uses (and why).